WASHINGTON, Jan 11 2014 (IPS) - Top diplomats and retired U.S. military officials are urging Western and African governments to step up the global fight against illegal wildlife poaching. Adding new pressure ahead of a major February summit slated to take place in the United Kingdom on the subject, a growing body of evidence suggests that wildlife poaching is funding criminal and terrorist organisations in several parts of Africa. These groups include Al-Shabaab in Somalia, and the Lord’s Resistance Army (LRA) in Uganda and South Sudan, who have reportedly turned to the killing of wild rhinoceros, elephants and other protected species to sell their tusks. Such trafficking is associated with a massively lucrative illicit trade. Ham suggested that an effective response to poaching in Africa could be to include a strong military component, possibly involving the use of unmanned aerial vehicles (UAVs), more commonly known as drones. “The use of drones is not only desirable, but is also likely to be very effective,” Gen. Ham said. Peter Westmacott, the British ambassador to the United States, seconded the call for a greater security mentality in the fight against wildlife poaching and trafficking. “The illegal wildlife trade is a tragedy for the natural world, but also for international security,” he said. An important next step, he said, would be the London Conference on Illegal Wildlife Trade, to be hosted by his government next month. 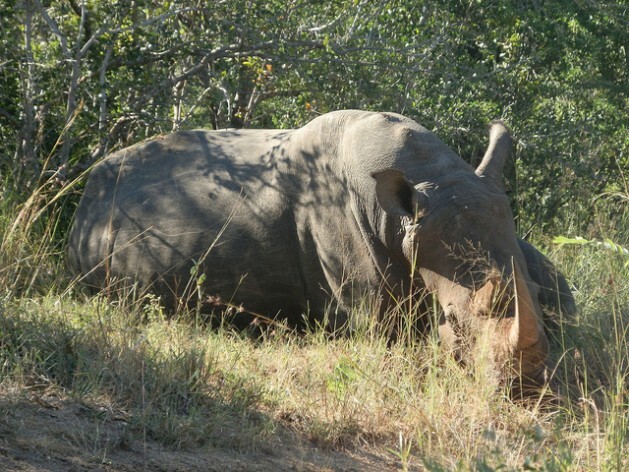 “Although we don’t know the full extent of [this] relationship, we know that there is an important link between poaching and … security,” Jonah Bergenas, deputy director of the Managing Across Boundaries Initiative at the Stimson Centre and the report’s author, told IPS. Western and African governments, Bergenas says, should cooperate with local actors in order to provide a truly comprehensive solution. According to the report, wildlife poaching funds a 19-billion-dollar industry worldwide, extending from Africa to East Asia and Western countries. Much of this demand continues to be powered by China. The impact on wildlife has been stark, and has grown significantly in recent years. In 2012 and 2013 alone, nearly 60,000 elephants and over 1,600 rhinos were illegally killed for their tusks. The driving force behind this practice is clearly the significant money that can still be made from these products. According to expert estimates, a rhino horn is worth 50,000 dollars per pound on the black market, more than the value of gold or platinum. This, activists say, makes poaching very hard to resist. “Most people know that this is wrong, but you need to make a distinction between poacher and poacher,” Andrea Crosta, the executive director of Elephant Action League (EAL), a U.S.-based group that fights poaching and illegal trafficking, told IPS. Crosta says a pair of tusks can be worth a few years’ salary in many African countries. Together with a team of EAL members, Crosta spent much of 2010 to 2012 investigating poaching in East Africa. According to their findings, large quantities of ivory were getting into Somalia in a systematic, organised way. Later, they discovered this process was being run by Al-Shabaab. “We were undercover, pretending to be researchers and zoologists, and that way we were able to speak with small and big traders, poachers and middlemen,” Crosta, who is currently based in the Netherlands, told IPS. His team was able to unveil an undercover trafficking system that saw between one and three tonnes of ivory getting into Somalia, facilitated by Al-Shabaab, every month. Diplomats and others are now calling on Western and African governments to pool resources in order to put an end to this illicit market. “People need to understand that wildlife trade is no different than the well-known blood diamond issue,” Peter Knights, the executive director of WildAid, an advocacy group that seeks to end the illegal wildlife trade worldwide, told IPS. Knights noted that a public awareness campaign, similar to the one aimed at delegitimising the “blood diamond” phenomenon, could be successful in stopping illegal poaching. “One of the best ways to do this is to defund [poaching] from the demand side by educating consumers in Asia and other consuming countries, urging them not to buy these products,” he said. Indeed, activists say the human aspect of poaching is often overlooked. Thousands of poachers are reportedly killed every year while hunting for elephants and rhinos, often leaving behind families with no income. Meanwhile, this week the Chinese government for the first time publicly destroyed several tonnes of ivory (the United States took a similar action in November). The step was widely lauded, particularly given China’s outsized influence on the global wildlife trade.